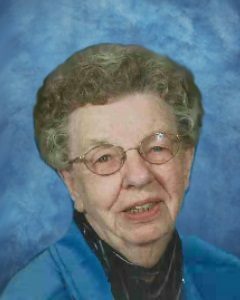 Pearl E. Betker, age 94, of Hutchinson, Minnesota, passed away Saturday, January 26, 2019, at Harmony River Living Center in Hutchinson. Funeral Service will be held on Friday, February 1, 2019, at 11:00 A.M. at Faith Lutheran Church in Hutchinson with interment in Oakland Cemetery. Pearl Elizabeth Betker was born on October 15, 1924, in Hutchinson, Minnesota. She was the daughter of John and Mette (Christensen) Jorgensen. She was baptized as an infant by Reverend Lund and confirmed in her faith as a youth by Reverend Swendsen, both at Danish Evangelical Lutheran Church, later known as Main Street Lutheran (now Faith Lutheran Church) in Hutchinson. She received her education at Hutchinson High School and was a graduate of Hutchinson High School Class of 1942. On June 11, 1947, Pearl was united in marriage to Kenneth Betker at Faith Lutheran Church in Hutchinson. This marriage was blessed with two children, Bruce and Sharon. Pearl and Kenneth shared 49 years of marriage until the passing of Kenneth in August 1996. While growing up she helped her family with the Hutchinson Hatchery. After high school Pearl held employment at various jobs in Hutchinson including the Hutchinson Library, the S&L Greenstamps and Hutchinson High School. Pearl later was employed at Minnesota Mining and Manufacturing in Hutchinson until retirement in 1985. After retirement, she worked part time at Target into her 80s. She was a member of Faith Lutheran Church. Pearl enjoyed traveling, puzzles, and playing pinochle and dominos at the Hutchinson Senior Center. She was very active member at Faith Lutheran Church, where she taught Sunday School, Release Time, and Vacation Bible School. She was an active member of the women’s groups and served as a president of the Ladies Aid. Pearl sang in the church choir, participated in bible studies, ushering, historical archival of church history, quilting, funeral kitchen help, and folding bulletins. She also volunteered as the block worker for the Heart and Cancer fund drives. Pearl and Ken raised their family in their home on South Jefferson Street. After Ken’s passing, Pearl moved to a townhome where she remained until March 2017, when she moved to Ecumen Oaks & Pines. In November 2017, she became a resident of Harmony River Living Center in Hutchinson. She passed away there on Saturday, January 26, 2019, at the age of 94 years. Pearl is preceded in death by her Parents, John and Mette (Christensen) Jorgensen; Husband, Kenneth Betker, Son, Bruce Betker; Great-Grandson, Bruce Haven Betker; Brothers, Gerhardt, Audley and Norman Jorgensen. Pearl was a beautiful lady. She knew so many people and made each one feel uniquely special. My prayers of comfort and strength throughout this time be with Pearl’s loved ones. Pearl & her family are in my prayers & thoughts. I will always remember Pearl when I was growing up at Main Street Lutheran Church in Hutchinson. Always very friendly to everyone. I know she was one of my best Sunday School teachers.